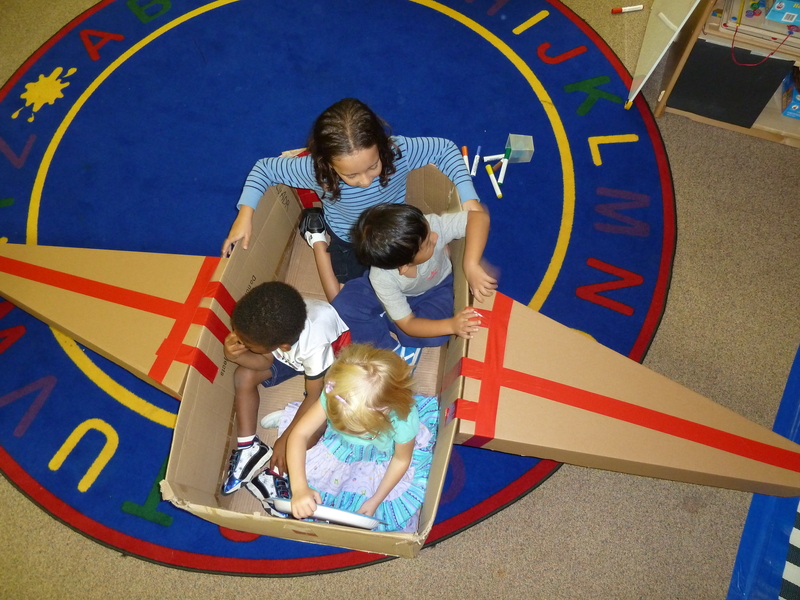 Our airplane has finally taken off! The children decided that duct tape would be the best solution to our wing problem and have since been flying all over the world. Our classroom babies (some named after little brothers and sisters) have flown first class to Florida. There was an expedition to Africa and a short flight to the playground. We had some extra, old headphones lying around and decided that they would make great headsets for the pilot and an air traffic controller. The loft lent itself well to the job of air traffic control tower. The only problem was that we only had two headsets and seven children. Thus, the pipe cleaner headset was born. A few of the models had microphone adapters on them, but most were designed simply with ear pieces and head bands. At the beginning of every school year, I introduce materials to the children in a slow, methodical manner. It is important for them to have many opportunities to explore the new items on their own before I give them specific tasks to complete. I also have the chance to learn a lot about how the children are thinking and where they are developmentally by observing how they interact with new materials. This week we experimented with pattern blocks, linking rings, and stringing disks. We also began our use of the listening center. This area of the room contains an old-fashioned tape player and books on audiotape. The children practiced starting and stopping the audio while listening to a story. Upon completion of the stories, their job is to draw something that they remember from the tale. Our first book was Fox Makes Friends, by Adam Relf.